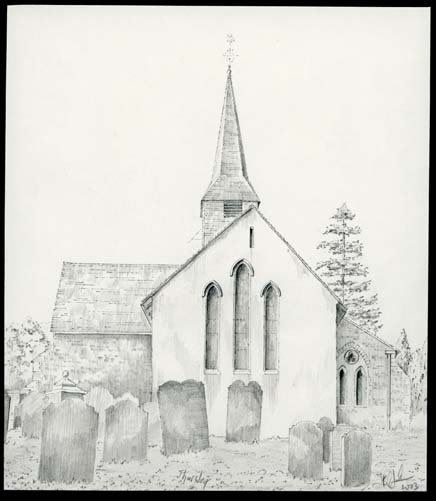 Original drawing by John Clark of the church of St. Michael in Thursley. The drawing shows the side elevation with a plain wall with three windows very prominent, and some graves in the foreground. The spire shows in the centre of the picture and there are trees in the background. Pencil on cream drawing paper. Item: St. Nectans Church, Hartland, Devon. Item: St. Pancras, Widecombe in the Moor, Devon. Item: St. Nicholas, Studland, Dorset. Item: St. Mary, Wareham, Dorset. Item: St. John the Evangelist, Escomb, Co. Durham. Item: St. Mary Staindrop, C. Durham. Item: All Saints, Herstmonceaux, East sussex. Item: St. John the Baptist, Little Maplestead, Essex. Item: St. Mary, Bramshott, Hampshire. Item: All Saints, Crondall, Hampshire. Item: St Swithin, Nately Scures, Hampshire. Item: St. Giles church, Camberwell. London. Item: St. Martin church, Monmouthshire. Cwmyoy. Item: St Nicholas church, Blakeney. Norfolk. Item: St. Mary the Virgin, Blanchland. Northumberland. Item: St. Andrew, Bywell. Northumberland. Item: Vicar's Pele, Corbridge. Northumberland. Item: St. Michael, Warden. Northumberland. Item: The Priory Church of St. Cuthbert and St. Mary, Worksop. Nottinghamshire. Item: St. Peter & St. Paul church, Exton. Rutland. Item: St. Mary Magdalene church, Tixover. Rutland. Item: St. Botolph church, Wardley. Rutland. Item: St. Mary church, Bruton. Somerset. Item: St. Mary Magdalen church, Chewton Mendip. Somerset. Item: St. Michael church, Dundry. Somerset. Item: St. Giles church, Leigh on Mendip. Somerset. Item: St. Barnabas church, Queen Camel. Somerset. Item: Holy Trinity church, Long Melford. Suffolk. Item: St. Andrew church, Alfriston. East Sussex. Item: Bayham Abbey, East Sussex. Item: St. Patroklus, Soest, Germany. Item: St Michael, Plumpton, East Sussex.